When a system defect or workplace disruption hits, you need to act fast to ensure the enterprise can continue to function, your employees and associates are informed and productivity is maintained . And where better to designate the first responder than your service - help desk with a focus on IT Service Management (ITSM). 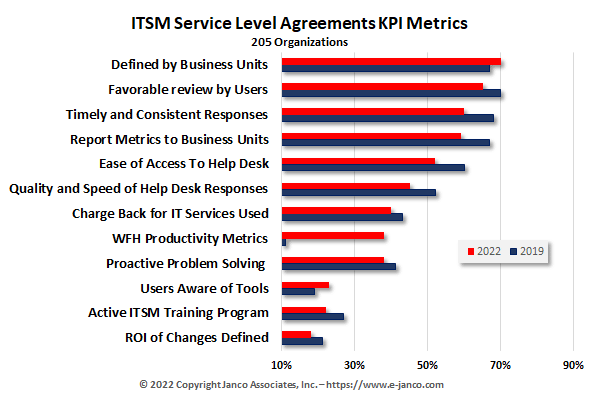 Over the late few years KPI metrics have taken off as measurement of the quality of IT's service has become a priority. Currently over 65% of all organization have implemented the KPI approach. In a survey of 205 organizations that have these metrics in place we found that user perception is the top metric that most are focused on. 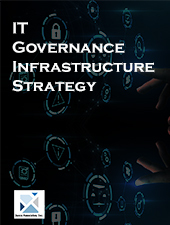 CIOs and enterprise executives demonstrate their own and the organization's commitment to manage all of the process in around solutions being implemented. Employees gain a solid understanding of why a change is being implemented. Everyone engages in the solution being implemented. Training is used to build knowledge in the implication of the change being implemented. Resistance is identified and dealt with early in the process. Communications are segmented and customized for each audience, answering the questions that they care about. Momentum is built throughout different areas and levels within the enterprise. Changes are less painful to the organization and to the employees. A coalition of support among senior leaders and managers creates momentum throughout the organization. Probability of meeting project objectives is increased. The enterprise builds a history of successful change. In addition, the ITSM template includes the Business and IT Impact Questionnaire, a Change Control Request Form and an Internet Use Approval Form. It conforms with ITIL. The template can be purchased by itself or with supporting job descriptions. We do provide an update service for the template as it is modified. You can see a full table of contents and some sample pages by clicking on the link below. IT Service Management for Service Oriented Architecture Template - Electronic document that contains standards, policies and procedures, metrics and service level agreement for the help desk, change control, and service requests. Individual policies are included for Blog, BYOD, electronic communications, Sensitive information, and Travel and off-site meetings. It also contains a Business and IT Impact Questionnaire, and several electronic forms included. They are: Blog Compliance Agreement; BYOD Access and Use Agreement; Email employee Agreement; Internet Access Request; Internet and Electronic Communications; Internet Use Approval; and, Sensitive Information Policy Compliance Agreement. 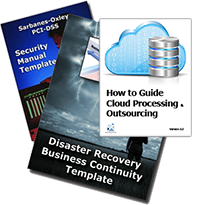 300 Full IT Job Descriptions - Includes all of the job descriptions (MS WORD format) in the IT Service Management - SOA Job Descriptions Bundle plus the full inventory of Internet and IT job descriptions contained in Janco's Internet and IT Job Descriptions HandiGuide. Security Audit Program - The Audit Program is IS0 28000, ISO 27000, Sarbanes Oxley, PCI-DSS, ITIL, and HIPAA compliant. It meets EU and US state requirements (Massachusetts, New York, and California) . Internet and IT Job Descriptions HandiGuide - The PDF book is over 800 pages in length and contains 300 Job Descriptions in addition to a Job Progression Matrix Template, Job Evaluation Questionnaire, Employee Termination Checklist (electronic form), and Position Description Questionnaire.